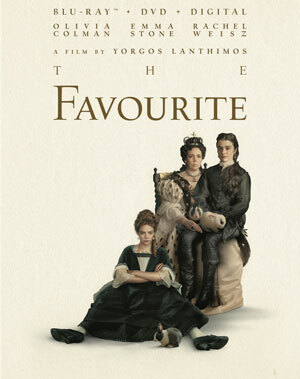 Twentieth Century Fox Home Entertainment has just release information about The Favourite, adding the critically-acclaimed movie to its roster for release on Blu-Ray Disc and DVD in March. In early 18th-century England, a frail Queen Anne (Oliva Colman) occupies the throne, and her closest Friend, Lady Sarah (Rachel Weisz), governs the country while tending to Anne’s ill health and volatile temper. When new servant Abigail (Emma Stone) arrives, Sarah takes Abigail under her wing as she cunningly schemes to return to her aristocratic roots, setting off an outrageous rivalry to become the Queen’s favorite. Unfortunately, Twentieth Century Fox Home Entertainment has no 4K UHD version scheduled for the release and also provides only a dearth of bonus features for the versions that are being released, as only a selection of Deleted Scenes and the Featurette Unstitching the Costume Drama are part of the package. Clearly, The Favourite Twentieth Century Fox Home Entertainment is not playing favorites with this release, as it ships it to stores around the country for you to own on March 12.